Hello! Sorry I've not posted in a little while, unfortunately my dissertation got the best of me for the past couple of weeks! 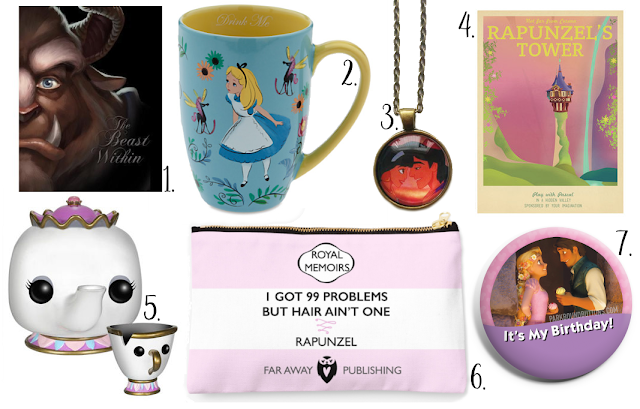 But I'm back and today I thought I'd share a little gift guide for Disney-Inspired presents under £15. If I don't already own any of these they're all on my personal wishlist so hopefully you'll find something here that you'll like too. 1. The Beast Within: A Tale of Beauty's Prince, Amazon (£11.04) - a perfect gift for someone who's a fan of both Disney and books. This book is a story about the Beast before the events in Beauty and the Beast from his perspective... Apparently he even used to be friends with Gaston! This would make a lovely gift as the art on the dustjacket/book is gorgeous. 2. Alice In Wonderland Mug, The Disney Store (£8.95) - Just when you think you can't buy any more Disney mugs, *BAM* the Disney Store hits you with another beauty like this. I love the illustrations they've chosen for it - it's such a pretty mug for spring. Plus it even says 'drink me' on the inside which is a super cute touch. I'm sure this would please any Alice In Wonderland fan! 3. I Choose Him Brass Necklace, Alice Vitrum (£4.50) - Alice Vitrum is full of lots of lovely Disney and other pop culture necklaces so if you're buying for a Disney fan who likes jewellery, you're sure to find something to suit them here. 4. Rapunzel's Tower Retro Travel Poster A5, Teacup Piranha Prints (£7.00) - I am so in love with the prints from this shop. They do a variety of Disney films in the style of retro travel posters and they're all absolutely stunning. I think this Rapunzel one would look lovely in a frame on a dressing table... I'm very tempted to get it for myself! 5. Mrs. Potts and Chip Funko Pop! Figures, Zavvi (£10.99) - Even if the person you're buying for doesn't collect Funko Pops! one of these would make a cute addition to anyone's desk and these Mrs. Potts and Chip figures are especially adorable! OMG that Punz bag is sooooo cute! I might need it in my life.